All of us have a tried and tested recipe that we fall back on during those days when we don't have time to think when we cook. 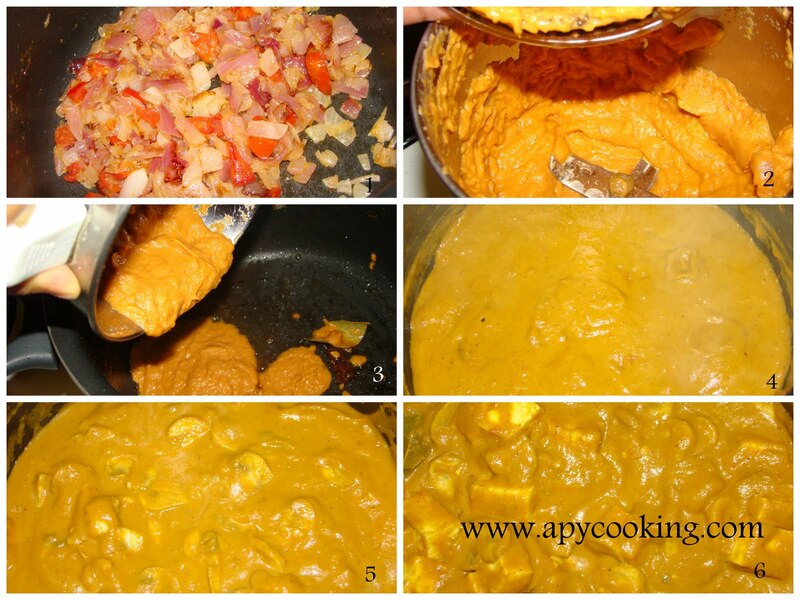 This curry is one such which I usually make with either paneer or mushrooms, sometimes eggs, sometimes mixed vegetables. Today as I was deciding between paneer and mushrooms, I wondered how a dish with both of these would taste. My son loves paneer, my husband loves mushrooms and I love both. So there you go. Best of both worlds. Why not? Before I move on to the recipe, I just thought I'd share a small tip with you. You may have seen a variety of masala powders in the market. And if you are a vegetarian, you may not have given even a second look to some of them. I mean, why would you want to buy meat masala powder when you don't eat meat at all, right? Well, maybe not. These powders are made of a variety of fragrant spices which can add a great deal of flavour to your vegetarian dishes. Yes, to your vegetarian dishes! I got this tip from my mum-in-law who once added some mutton masala powder to some veg curry she was making. For once I was taken aback when I saw 'mutton' written on the packet (she is a staunch vegetarian) but hey, there's no mutton in there. She also introduced me to Kitchen King masala which I make a point to have in the pantry always. The taste and spice levels of all these masala powders, ofcourse, vary. So be careful if you are adding any extra chilli powder. You can probably add salt as you roast the masala powders, check the spice level and adjust accordingly. If you don't have any of these fancy masala powders, just add some chilli powder, coriander powder and jeera powder to taste. 1 tbsp meat curry masala /mutton masala powder/ tandoori masala / pork vindaloo masala/ kitchen king masala etc. or a combination of these. Dice onions and tomatoes. Chop mushrooms into thin slices. Chop paneer into smaller cubes. In a large deep-bottomed pan, heat oil. Saute onion. Add ginger garlic paste and roast till onions turn brownish (you can cover the pan to quicken the process). Add tomatoes and saute till completely cooked. Allow to cool. Transfer to a blender and grind into a smooth paste (without water). In the same pan, heat 1 tsp oil. Add cloves, cinnamon and bay leaves. With the heat on low, add the ground paste and mix. Turn the heat to medium, add the powders and roast for a few minutes. Check the spice level and adjust accordingly. Pour milk and water, mix well and bring to a boil. Add the chopped mushrooms and salt and cook covered for 4 to 5 minutes. Add ghee for some extra flavour [I did not add]. 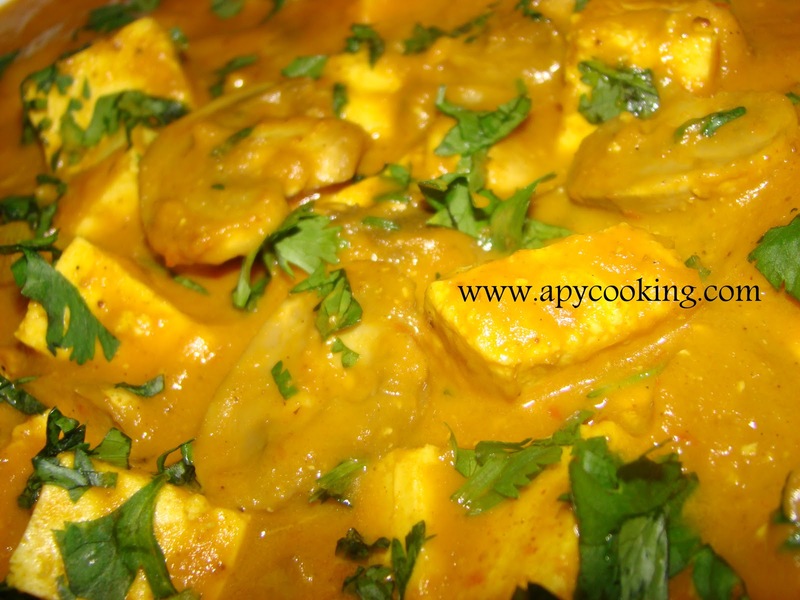 Add paneer pieces and cook for another couple of minutes. 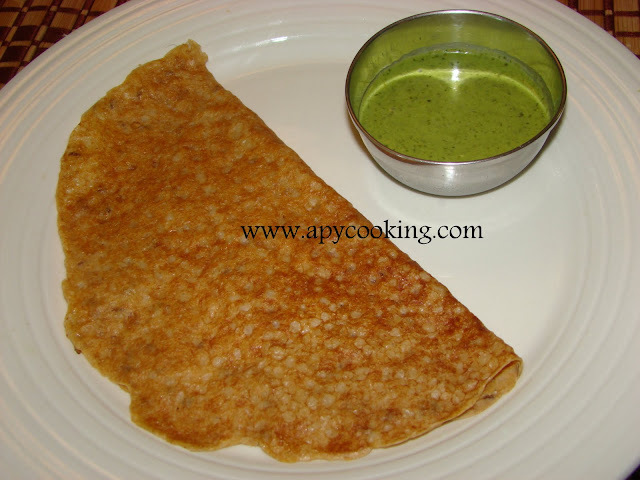 Serve with naan, chapatis or rice. Drool. 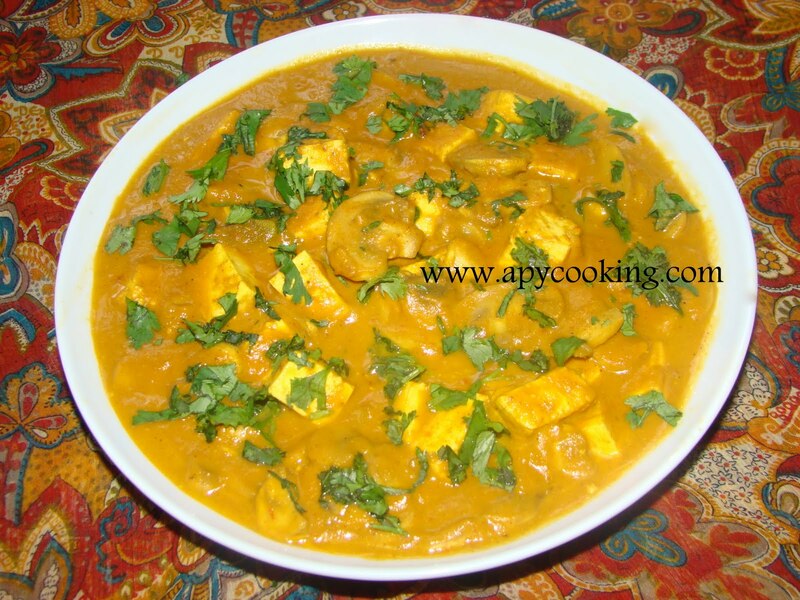 Enjoy the bite of the mushrooms and the softness of the paneer. A couple of years ago, my aunt Lakshmi Akka brought us some delicious almond burfis which I totally loved. We had some cousins visiting last weekend and I thought of making these burfis for them. I immediately called up Lakshmi Akka who gave me a detailed explanation of making these burfis. They came out quite good and the cousins liked them too. Soak almonds in hot water for 20 minutes. Drain water. Peel the almonds and discard the skin. 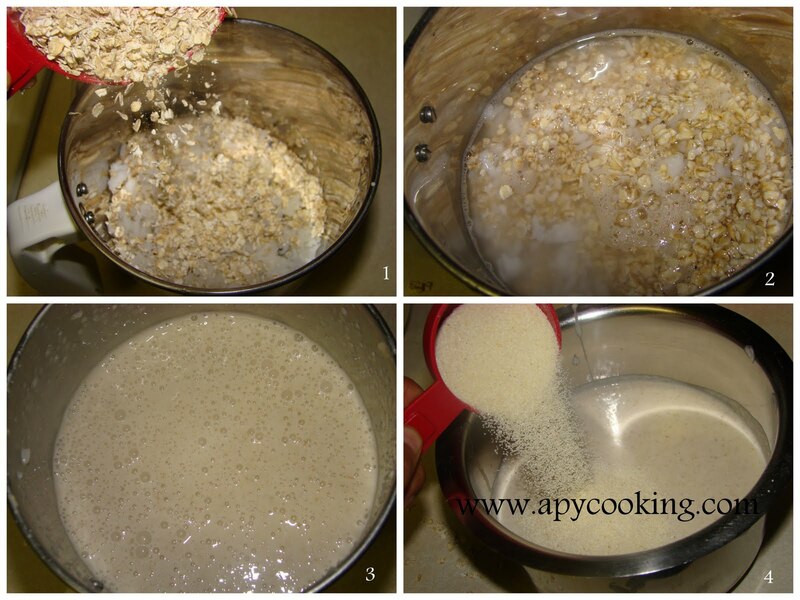 Grind almonds with milk into a thick, smooth paste (add more milk if required). 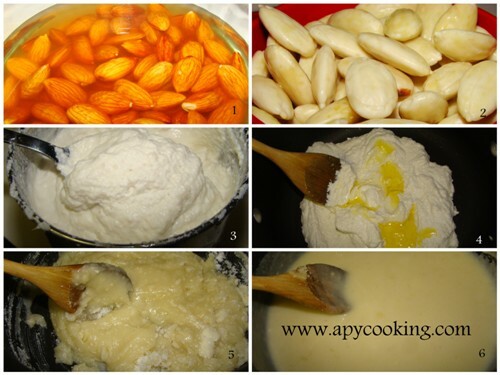 In a large deep bottomed pan, transfer the almond paste. Pour 1 tbsp ghee and mix well. Turn the heat to medium and keep stirring for a few minutes. Add sugar and stir on medium heat for about 20 minutes. 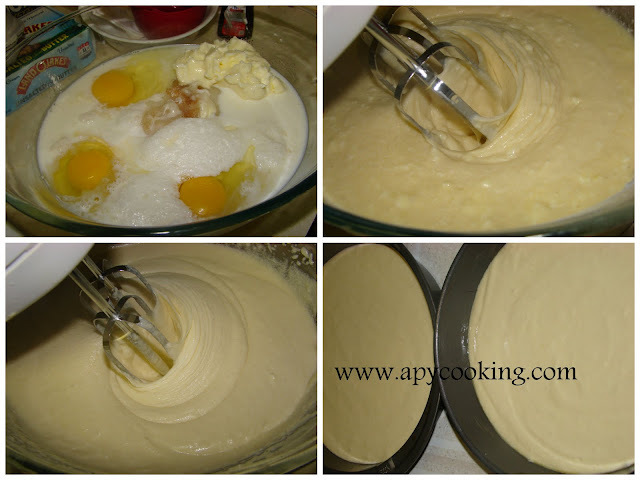 Scrape the sides as you mix. [If you cannot stand in front of the stove the entire time, just reduce the flame to low and stir every minute or so. But towards the end, make sure you are right there, mixing well, otherwise the bottom portion can get burnt]. The mixture will start thickening and will leave the sides of the pan. 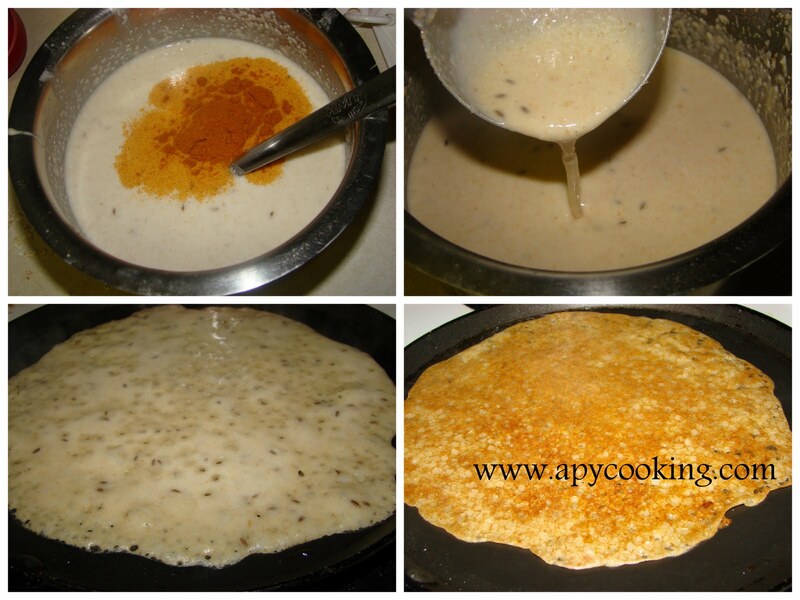 Don't remove from heat until the mixture stars resembling chapathi dough. Now add the rest of the ghee, switch the gas off and mix well. Keep a large plate [I used a glass dish] greased with ghee ready. Transfer the mixture to the plate. With a spatula spread it across. You can smoothen it with the back of a glass. Immediately cut into squares. Allow to cool for a bit and transfer to an airtight container. Note : Once the mixture starts resembling chapati dough, you have to work really fast. I stopped to take pictures and the mixture became drier than I'd have liked. Make sure you have a (liberally) greased plate ready. 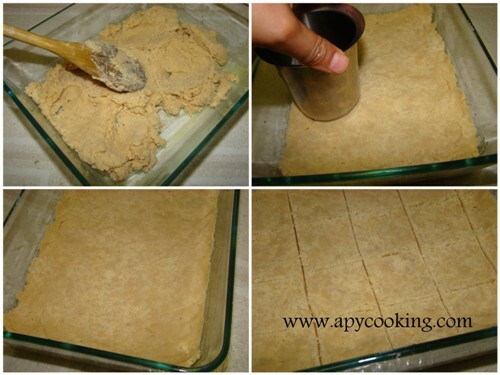 When you cut into squares, grease the knife with ghee to avoid the burfi from sticking to the knife. 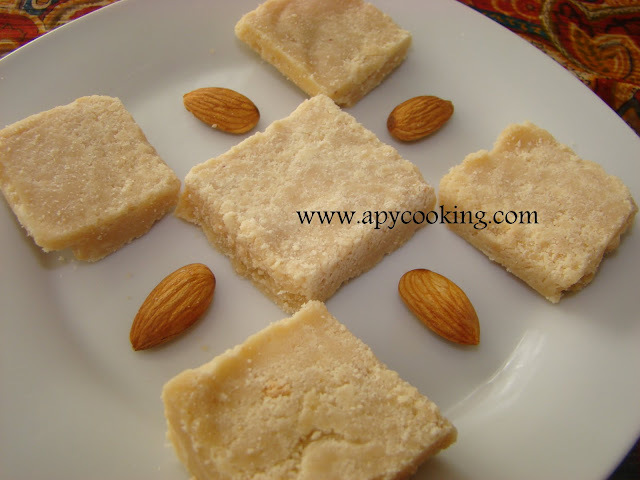 If you feel the burfi is too soft, that means you may have removed the mixture from the pan too soon. Just stick them into the refrigerator and they will harden. 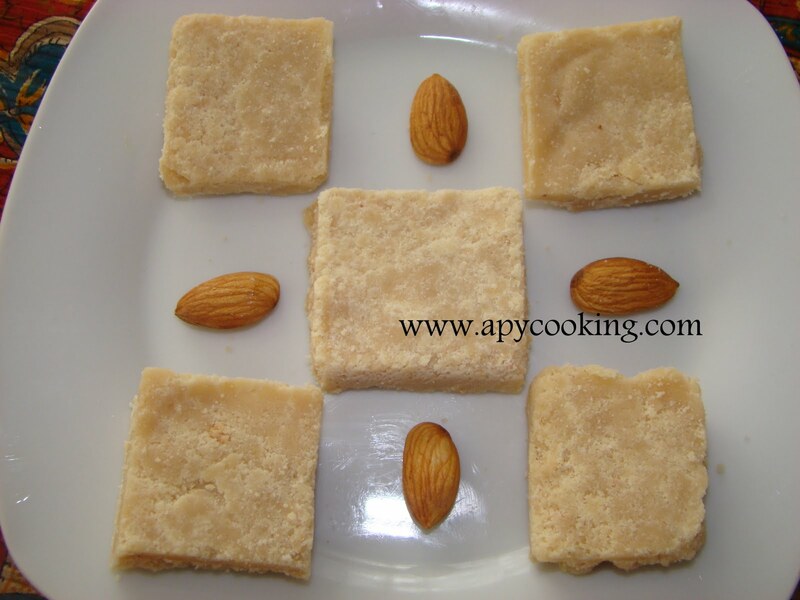 Check my post on 7 cup burfi. 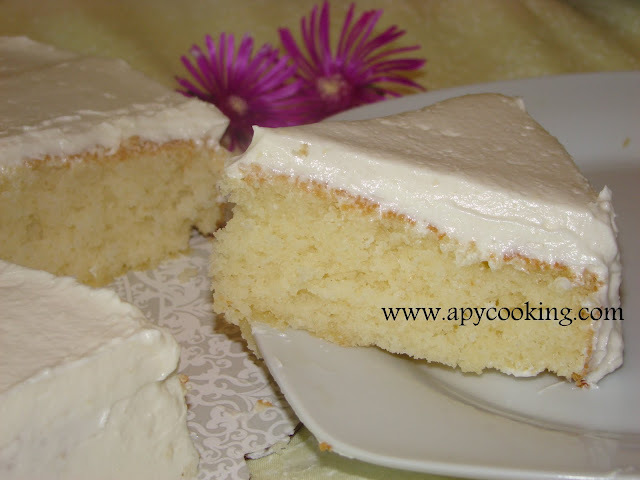 When I first came across this recipe, I was surprised to see flour as a base for frosting. It really intrigued me. So I went ahead and gave it a try and was delighted by the result. 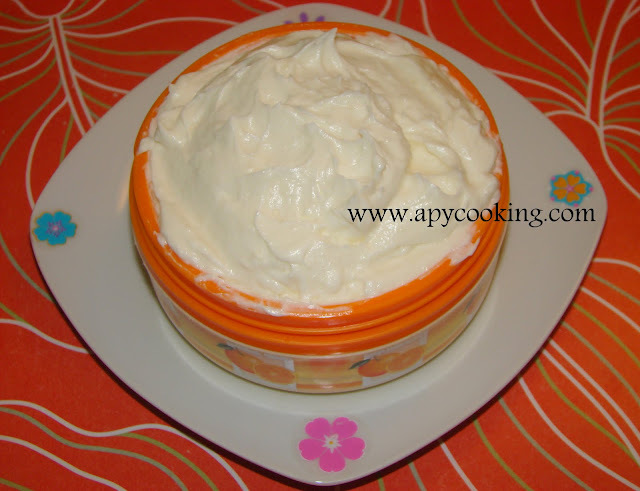 The frosting turned out light and airy, had a nice spreadable consistency and was DELICIOUS! If you feel buttercream icing has too much sugar and whipped cream icing is all fat, you may want to try this tasty, pudding-like frosting. The ingredients are easily available so you don't need to think twice before trying it out. 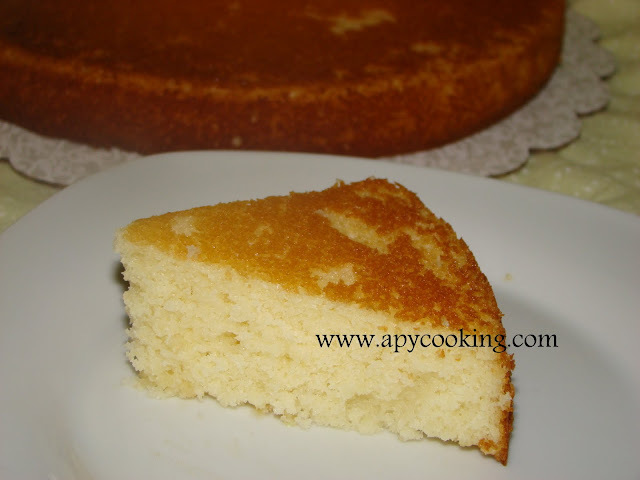 I found the recipe here and made a couple of minor changes. In a medium pan, pour in the flour. 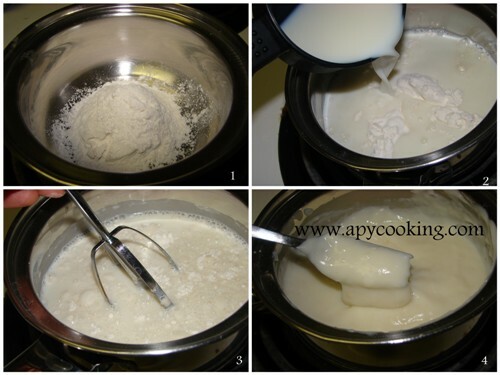 Add (cold) milk and with a manual whisk or fork, mix the flour and milk thoroughly. Turn the heat on to medium. Keep whisking the mixture as it heats up and thickens, about 8 to 10 minutes. 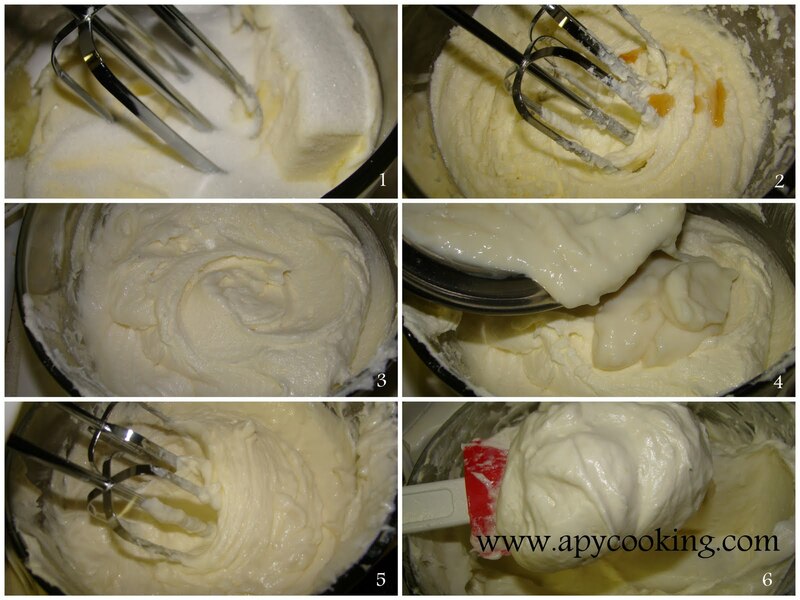 Whisk vigorously if you see lumps forming. The mixture has to be of thick consistency and lump-free before you remove from heat. Allow to cool completely. In a large bowl, with a hand-held electric mixer, cream butter and sugar. Add vanilla and beat further, scraping the sides with a spatula. 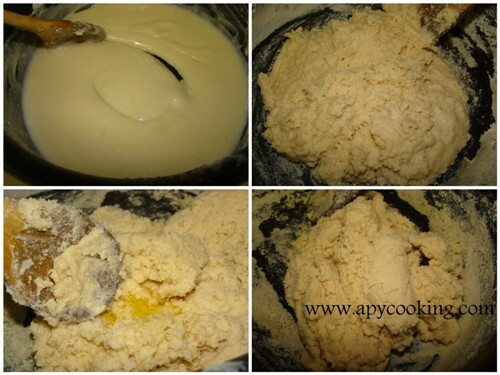 When the mixture appears creamy, add the flour-milk mixture. Beat on medium speed for a couple of minutes, scraping the sides. If the frosting appears grainy, beat for a few more minutes. Note: If you refrigerate the frosting, before using just bring it back to room temperature and stir well for it to come to it's original spreadable state. 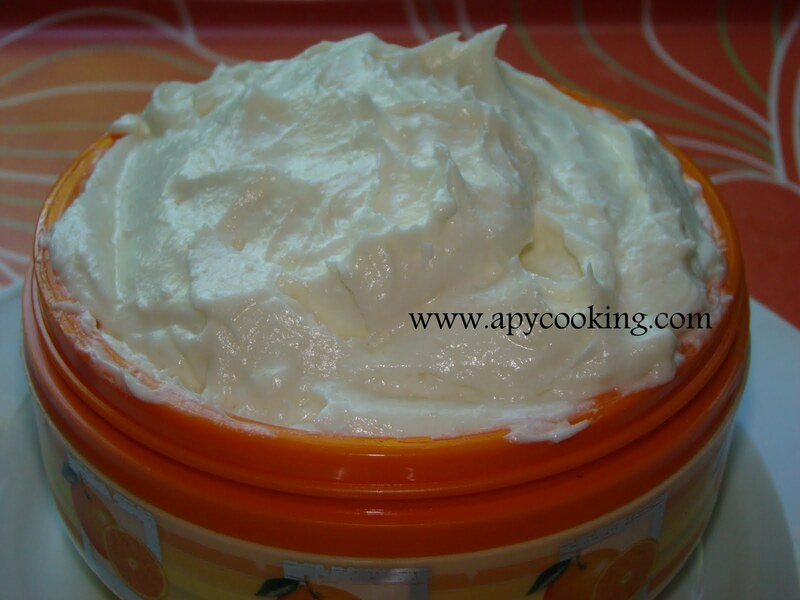 Enjoy this luscious yummy-ness on your cakes or cupcakes! The recipe for the cake shown can be found here. 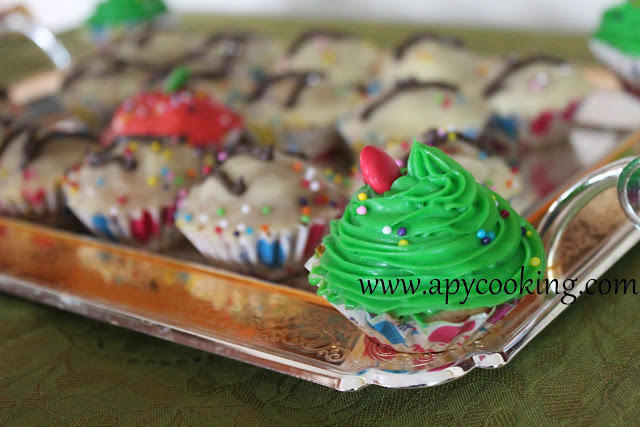 Here's another picture where I swirled the frosting on cupcakes.